“ISD to be the most preferred Indian Community School”. 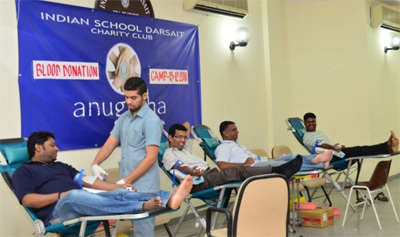 The firm belief of the school that knowledge includes all training that is useful for the service of mankind resulted in the launch of “Anugraha” the Charity Club on 14th November 2009. The club, dedicated to community service, began its activities with 13 student volunteers and 2 teachers with a view to instilling values like compassion, dedication, love for fellow being and nature in children. The motto of the club is "Service with a Smile". After four years of sincere service, the club has grown with 640 student volunteers from classes VI to XII and 10 teachers organizing various activities round the year for the betterment of the community. The Principal of the School, the patron of the club, extends his whole hearted support to every activity. 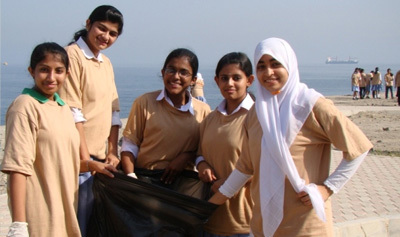 The major activities organized annually to equip students with the skills and attitudes necessary for constructive participation in the task of social change are fund – raising programmes for Early Intervention Centre, Azaiba, blood donation camps involving teachers and parents, Skill Development Programmes to improve communication, creativity, social interaction, personal development and responsibility etc for the members, beach cleaning drives, various counselling sessions and environmental protection campaigns. The major achievement of the club towards inculcating love for the environment is the success of the 'No Plastic Campaign' initiated in 2010. Annual Sale of Jute bags is an integral part of this campaign. Thanks to the efforts of the staff and students alike today, Indian School Darsait is a NO Plastic Campus. Another Campaign which is in its initial stages is the 'Save our Trees Campaign' the first step towards this has been taken with the support of the parents who have opted for e circulars so that the use of papers could be reduced. Sponsoring students through payment of fees, by providing free books and uniform are all the special tasks undertaken by the volunteers of the club who receive training at the annual camps organized for them.